Haha. An apple a day. Just like Gizmodo with all this Tablet news! Get it?! Funny. But this is different. It's a calendar concept. An ingenious one at that—and healthy too! Unfortunately, these calendars are only available in AOK health insurance offices. 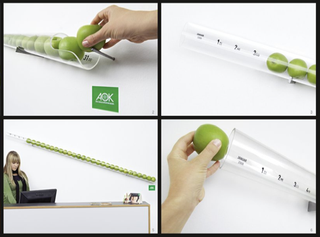 They were created by Serviceplan, an ad agency in Munich, and can hold 28, 30 or 31 apples. Just adjust the tube depending on the month. Ed. Note: The Munch pun was, sadly, a typo. Fixed. -j.l.